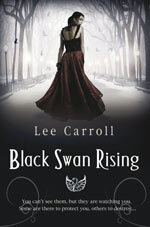 Nathaniel Cade, the President’s vampire, has fought one particular evil over and over again: the source of urban legends and nightmares across the country. It has gone by many names and guises, but is best known by the one that all children instinctively fear: the Boogeyman. No matter how Cade kills him, the Boogeyman always comes back. When the killer begins targeting the president's people on the campaign trail, Cade and his human handler, Zach Barrows, are tasked with cleaning up the mess before it spills over into the upcoming election. Cade and Zach must stop the one monster Cade has never been able to defeat completely. And they must do it before the Boogeyman adds another victim to his long and bloody list: the President of the United States himself. 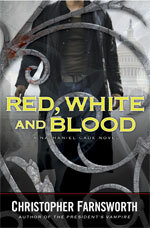 Red, White and Blood is the third outing for Christopher Farnsworth’s vampire secret agent Nathanial Cade. Once again the author delivers an action packed, fast-paced tale of supernatural national security threats that can be countered only by the American President’s secret weapon – Nathanial Cade, a vampire who is oath bound to serve and protect the President and his office. While there is some continuation in plotlines from the previous novels Red, White and Blood is pretty much a self-contained story – so you don’t need to have read the previous novels in this series first before starting this one. Red, White and Blood is set against the back-drop of an American election campaign. The President is looking to get re-elected while demonic forces aligned against America are looking to slaughter him in a most bloody fashion on the election trail. This time the villain of the piece is the Boogeyman, a murderous beast who has launched a hundred urban myths – usually involving teenagers making out in a remote location before being hacked to death. The Boogeyman is a parasitic demon, you can kill its host but the Boogeyman always returns. Cade knows this from first-hand experience, having killed it many times, in many bloody ways, in the past. This time out the Boogeyman is behaving differently, targeting the President instead of hormone-fuelled teenagers, a worrying development for Cade since he knows that a demon, like a vampire, can not change its inherent nature. Christopher Farnsworth’s trademark writing style of quickly flitting from one character or plotline perspective to another gives the story a slick, almost cinematic feel. In some ways this style is reminiscent of a TV tie-in book, like the story has been constructed out of a screenplay rather than being a story for the written medium from the outset. For the most part this style serves the story well, even as the perspectives constantly shift the body count inexorably rises, and the resulting book is a gory, fast-paced supernatural action thriller. The downside to the quick perspective shifts is that there is little room for in-depth character development, leading to a slew of one-dimensional characters that are difficult to engage with on any but the most superficial level. However, with supernatural political conspiracies, shadowy anti-government organisations, a vampire secret agent and a serial killer straight out of a teen slasher movie – why wouldn’t anybody want to read this book? If you’re looking to escape real life (or the real life Presidential election race) for a while by spending some time reading you need look no further than Red, White and Blood.